The Ethics Board convened on March 20, 2019 to discuss Alice Taylor’s appeal against Shqiptarja.com. 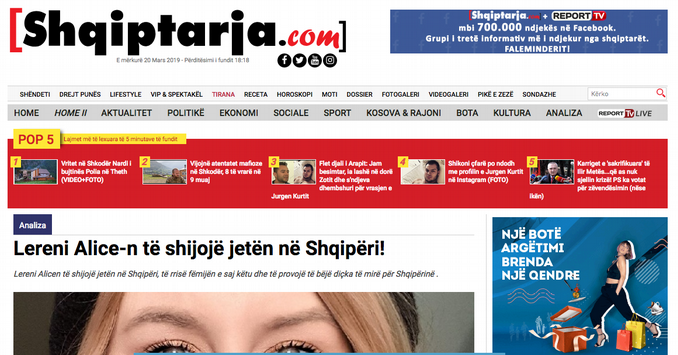 The complainant complains that the information provided in the article (link: Https://shqiptarja.com/lajm/lereni-alicen-te-shijoje-jeten-ne-shqiperi?r=pop5s) is incorrect, based on speculation. 1 / A Accuracy. This article has been violated because the information is not verified and is misleading. 1 / B Unbiased Journalism. The information is clearly biased. Arguments on journalist Taylor are built on opinions not facts. 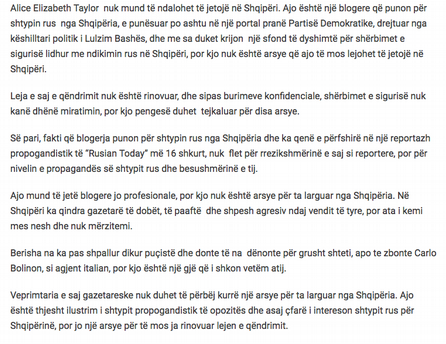 Frazat “works for the Russian press from Albania”, “employed by PD (party)”, “Directed by the Political Advisor of Lulzim Basha…” are opinions, no facts. The phrase: “Creates a dubious background for security services” and the phrase “permission of stay is not granted… confidential sources say they have not renewed it” is an opinion rather than a fact. The Article has personal insults such as “mediocre (“e dobët”) journalist” or “aggressive”. By treating her as a Russian agent, accompanied with her picture, the journalist is put at risk of becoming a target of violence. We recommend that portals that have released these news must take them down or/and take them out of circulation. Members of the Board present at the meeting: Agim Baçi, Mark Marku (deputy chairman), Enio Haxhimihali.